If you remember, a few days ago I posted a prayer request for a cyber-friend named Bill whose prostate cancer has metastasized up his spine into his shoulders and neck. You folks responded generously with prayers, jokes, anecdotes, funny stories, and other comments designed to lift his spirits. As of this writing there are well over 100 comments left by you wonderful people. And oh my goodness, you have no idea how much this meant to him. He emailed me and said, "I saw all of those comments and was totally overwhelmed, and just cried and cried. They meant so much to me, and I don't know how, or where to say something. But, please let them know I am reading every one, though it is taking me some time." Bill called last night and we talked for three hours. His language skills are fading and this scares the bejeebers out of him, as you can imagine. He often lost the simplest word, and he found it helpful when I was able to fill in a blank for him. The inability to communicate through language -- the most elemental skill for everyone -- is a source of deep frustration for him. But he can still read, and he's read every single thing you've posted. Bill wanted me to pass on to everyone how much he appreciates your prayers and thoughts. Appreciate doesn't even begin to express the depths to which those comments helped him through some dark hours. His battle is by no means over. Some readers were generous in sending links to possible treatments (and yes, every single thing that was sent to me, I immediately forwarded to him) but I fear it might be too late. "My brain has been injured by the pain medication, at least according to my docs, but it really scares me which is very embarrassing to me," he writes. "I'm about to start with yet ANOTHER radiating treatment, this time against a thing, a bump thing whose name I knew yesterday! that is growing in the left side of my neck. I am scared that I'm losing more language and words...I may cry on the phone with you. I hope that's OK. I'm a bit scared about it, and that is brand new to me." Bill did indeed cry a bit on the phone, but frankly not as much as I would were I in his shoes. He gave me permission to post this update and he was fervent in his wish to thank each and every one of you. By his own admission (especially since he lives alone), Bill needs to get into a nursing home, but he is hampered by the need to sell his condo in order to fund it. He does not want to go on the government dole in order to get into a care facility. I'm asking for additional prayers for him -- for peace of mind, and for a buyer for his condo so he can get the care he needs. And thank you all for your prayers. I love my readers! Bill, you are not alone in anything. My best friend at age 29 (last year) was diagnosed with breast cancer, a month later after her sister got married her sister went to the doctor because she was feeling lethargic and turned out she has lukemia. Both girls has treatments, the sister with lukemia was hospitalized for a month due to the heavy treatments she was getting. My best friend is clean and clear so far. Her sister just found a lump in her breast and it is cancerous, but yet talking to her she said "Bring it on, I am a fighter, and if I don't make it then God was ready for me and I am happy to go". So Bill you are not alone, everyone is praying for you and fight the best you can and see how things go, miracles happen every day! Sending prayers your way! This man was diagnosed with Stage IV prostate cancer that had metastasized to the bone. He treated himself with baking soda and molasses. Cancer likes sweet. Molasses was a carrier to the cancer cells. "Long story short. I did it. I drank a baking soda solution I started 2 June 2008 and quit 12 June 2008. I quit because I was scheduled for another bone scan on 13 June 2008. They wanted to see how far that doctors’ thing spread or if what they were doing has slowed it down...."
"So back to the follow-up bone scan (I am in Oregon now)…. I went through another space ride through a fat donut once more. This time, however, I was hoping for hope. I don’t know why I was hoping, because all my research indicated that once cancer got into the bones you are toast. Anyway, I got bone scanned and waited for the report. The report arrived in the mail a few days later. I was nervous and did not want to open it. As a matter of fact I am crying right now just thinking about it. I finally opened it to these words:"
“NO CONVINCING EVIDENCE OF AN OSSEOUS METASTATIC PROCESS” I bawled like a baby." "Two days later I got another report in the mail about my blood tests: PSA is now 0.1…. That is zero point one! " Prayers for your friend. I know that God will give him all the strength he needs. Patrice, do you know if he has looked into a reverse mortgage? It might solve his problem more quickly than waiting for a private buyer. Just a thought. I did not post a comment when you asked for prayer but I did (and do) pray for his peace and ease through through this difficult situation. I pray for you every night that your pain and fear is eased. Trust in the Lord, he is always there to help and comfort. "I just want enough money to go out and buy me a bicycle." said the little boy. bicycle in a long time and wasn't sure he could still ride one. The preacher told him, "Just keep trying. It'll come back to you." The preacher took the mower and began to crank it. He pulled on the rope a few times with no response from the mower. The preacher called the little boy over and said, "I can't get this mower to start." The little boy said, "That's because you have to cuss at it to get it started." The preacher said, "I can't cuss. It's been so long since I became a Christian that I don't even remember how to cuss." The little boy looked at him happily and said, "You just keep pulling on that rope. It'll come back to you." Now, I bet THAT one put a smile on your face! there is a possibility that bill might be able to get in-home hospice care at no cost. his doctors might be able to advise him on that. in the meantime, we will continue to pray for him. Bill, I can offer no jokes to make things better. I can offer no sage advice or words of wisdom. I sense you are scared and feeling alone and worried. Who wouldn't be? I know I'd be all those things and more - I'd probably be hiding under the covers in the hope that it was all a bad dream and I'd wake up from it soon. Sadly, this isn't a dream - it's what we will all face at some point in time. This is the flip side of life. Just as being born is frightening and so new to a baby, so too is life slipping away so very frightening and new to an adult. 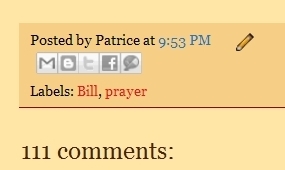 Pray, Bill. Pray for yourself, for clear meaning from the Lord. Pray like never before. If your prayers seem to go unanswered, it's only because He has better plans for you. Keep the faith, Bill, and He will guide you through. You are NEVER alone. Remember that. Such kindness as is seen here warms my heart and reminds me to always look for the good, because it's usually there somewhere. Blessings to you and may God provide. It's good to know you've received all our messages and are making your way through them. I'll be praying for your very highest and best good and that you'll feel the love I and others here are sending your way. Don't mean to sound weird, but I'm in Albuquerque, NM, if Bill is anywhere near me. I know other Christians around the country if he truly needs someone to help him. Can't stand the thought of him struggling all by himself.